Oregon Business magazine’s seventh annual 100 Best Nonprofits to Work For project attracted more than 150 nonprofits from around the state from a variety of sectors, including social services and environmental advocacy. More than 5,000 employees and volunteers filled out the survey, rating their satisfaction with work environment, mission and goals, career development and learning, benefits and compensation, and management and communications. 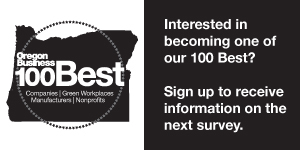 Striving for social equity is the mission of many nonprofits, and this year’s 100 Best Nonprofits to Work For in Oregon survey shows employees are most satisfied with their organizations’ fair treatment of differing racial, gender, disability, age and economic groups. But as a national discourse about racial discrimination and equity for low-income groups takes center stage, data show Oregon’s 100 Best Nonprofits to Work For still need to make progress on addressing these issues within their own organizations.